Edirol has given its R-09 digital audio recorder a bit of a shot in the arm to help it compete with the slew of other low-cost recorders on the market today. A few years ago when Edirol launched the R-09, it was one of just 2 or 3 prosumer level recorders available for under $500, and it got rave reviews. But since then, it’s received plenty of competition. So it’s about time we saw an update. The Edirol R-09HR (for high resolution) looks a lot like its older sibling, and tha’t s a good thing. It’s designed to fit easily in your hand or pocket. The button layout does appear to have received a bit of a redesign. But the big changes are under the hood. The R-09HR can support 24-bit 44.1/48/88.2/96KHz recordings, while the older model topped out at 48KHz. The R-09HR can also support SDHC media up to 8GB, while the original R-09 could only handle 4GB. Update: It looks like you can add support for 8GB SDHC cards to the original R-09 through a firmware update. The latest firmware update also adds the ability to split files while making a recording. The new unit also has a rubberized case instead of the old plastic case, there’s a new monitor speaker on the back of the unit, a remote control for triggering and pausing recordings from up to 10 feet away, and a playback speed control. The R-09HR also comes with Cakewalk Audio Editor LE digital audio editing software. 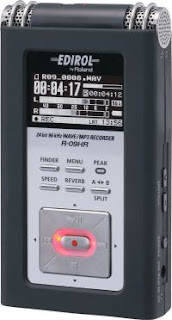 The R-09HR appears to be on sale in the UK for about £249.00, which is around $500 US. But it’s not clear how much the recorder will cost in the US, as electronics tend to be cheaper this side of the Atlantic. I didn’t care for the noisy preamps on the R-09 so I hope they addressed that in this update. Can it playback Flac/Ogg files from a pre-recorded SDHC ?